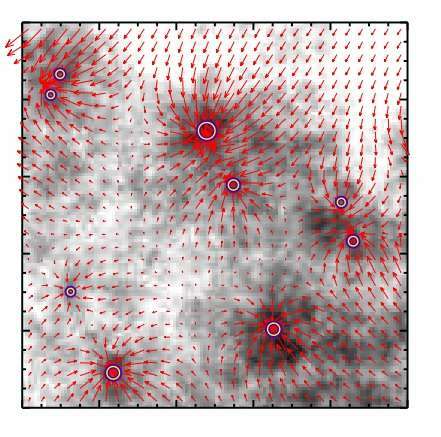 For the first time, scientists have used methods of network science to solve a fundamental astrophysical problem—explaining the so-called "stellar initial mass function," a distribution of stars by mass in galaxies and star clusters. The study has been published in the recent issue of The Astrophysical Journal. University of Michigan graduate student Andrei Klishin, under the supervision of Igor Chilingarian of the Sternberg Astronomical Institute, Moscow State University and Smithsonian Astrophysical Observatory, applied methods of network science to solve the 60-year-old astronomical problem. "Such methods have been used across different research fields, from sociology and information science to molecular biology, but never before in astrophysics," Igor Chilingarian says. The stellar initial mass function describes the relative fractions of stars with different masses in a stellar system or a ratio of big and small stars in galaxies. In 1955, the theoretical physicist and astrophysicist Edwin Salpeter was the first to derive this distribution law empirically in the stellar neighborhood using star counts (presently known as the "Salpeterinitial mass function"). He demonstrated that the distribution of stars by mass has the shape of a power law with exponent of -2.35, i.e. the stars 10 times more massive than our sun are 102.35 = 220 times less numerous than solar-type stars. How, exactly, stars in a galaxy or a star cluster are distributed by mass is crucially important for astronomers. A stellar system is like a big family in which all members interact. They delineate the "living space" in a certain way and react to external influences according to the same physical laws. In order to better understand how members of that family affect each other's evolution, astronomers need to know what types of stars the family consists of—i.e., to know how many stars of each mass there are in the system. Igor Chilingarian and Andrei Klishin described a system of proto-stars that evolve by absorbing gas from the diffuse interstellar medium as a spatial network growing by the principle of preferential attachment: A node having many links creates new links even faster. In the interstellar medium, links are gravitational forces acting between molecular dense cores that will later form stars. 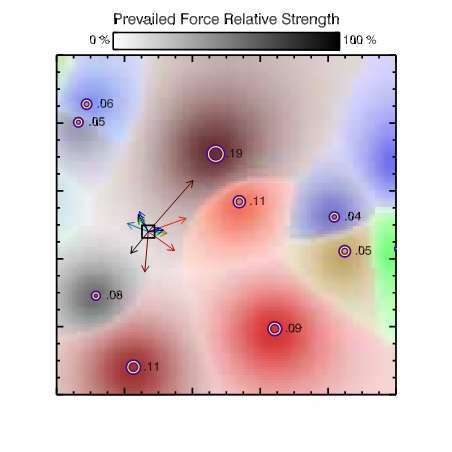 "We demonstrated that a power law that governs stellar initial mass function arises independently of the initial mass distribution of proto-stars if the density distribution in the interstellar cloud is fractal. This fractal distribution directly follows from the classical theory of turbulence developed by the Soviet mathematician Andrey Kolmogorov. We encounter fractal, or self-similar objects on a daily basis. 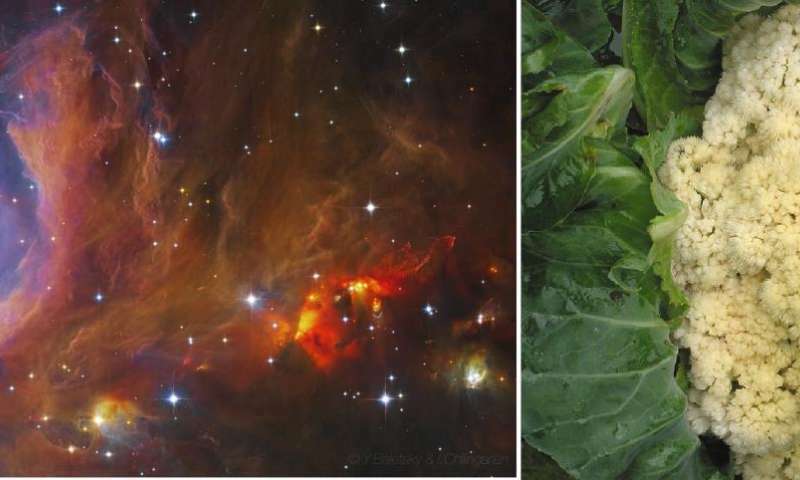 Among others, clouds in Earth's atmosphere, snowflakes, and even some fruits and vegetables, such as cauliflower or broccoli, demonstrate fractal properties," says Igor Chilingarian. In the framework of this simple model, the scientists theoretically explained the stellar initial mass function shape in just eight equations, which did not invoke any unjustified assumptions or require extra free parameters of many existing star formation theories. Igor Chilingarian emphasizes that all existing initial mass function theories were developed using "a classical astrophysical approach" and presented in long articles featuring dozens of pages of calculations and hundreds of formulae. "Igor invited me to work on this project after we met in Boston, when I mentioned my interests in statistical physics," Andrei Klishin says. "This area of physics deals with the aspects of systems of large numbers of particles where particular details regarding individual particles become unimportant. We know that the same Salpeter power law exponent of -2.35 was measured in many star clusters of different ages, metallicities and total masses. This suggests that the value is determined not by some local properties of a specific cluster, but rather by some more general principle. That's why when we introduce the principle of preferential attachment in our paper, we refer to works in network science, bibliometrics, biological speciation. In all those very different systems, the statistical properties turn out to be very similar." Network science is a modern area of research that researchers developed over the last 15 to 20 years. As suggested by its name, it studies properties of networks as mathematical objects, regardless of the specific system interpreted as a network. Network theory can, for instance, describe power grids as a set of power plants, loads and transmission lines; it also describes the interactions of a multitude of proteins in a living organism, connections of users in a social network such as Facebook or even the entire web, or communications in scientific collaborations. Igor Chilingarian and Andrei Klishin were the first to apply network science methods to solve a fundamental astrophysical problem. "This work is the first of its kind, and it creates a basis for a new interdisciplinary approach in astrophysics. We plan to further develop this family of methods and use them to study a broad spectrum of astrophysical phenomena in aspects of star formation and in observational cosmology, such as a study of the large-scale structure of matter distribution in the universe," says Igor Chilingarian. It would really behoove the mods on here to have a "clean out the EU horseshit" day and just identify the 4 or so independent accounts that only come here to troll and are never responsive, and their socks.